When deciding on a machine learning conference, why go to Mega-PAW Vegas 2019? 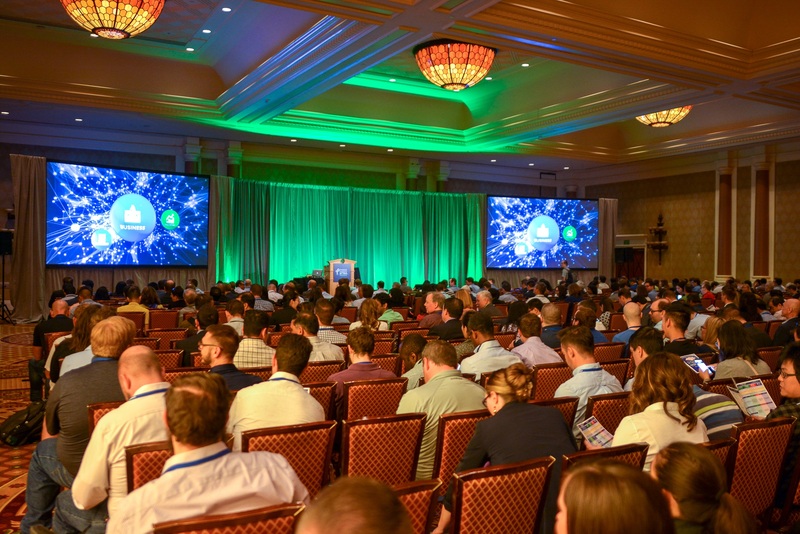 This five-conference event – June 16-20, 2019 at Caesars Palace – delivers brand-name, cross-industry, vendor-neutral case studies purely on machine learning’s commercial deployment, and the hottest topics and techniques. In this video, PAW Founder Eric Siegel spills on the details and lists five reasons PAW is the most valuable machine learning event to attend this year. 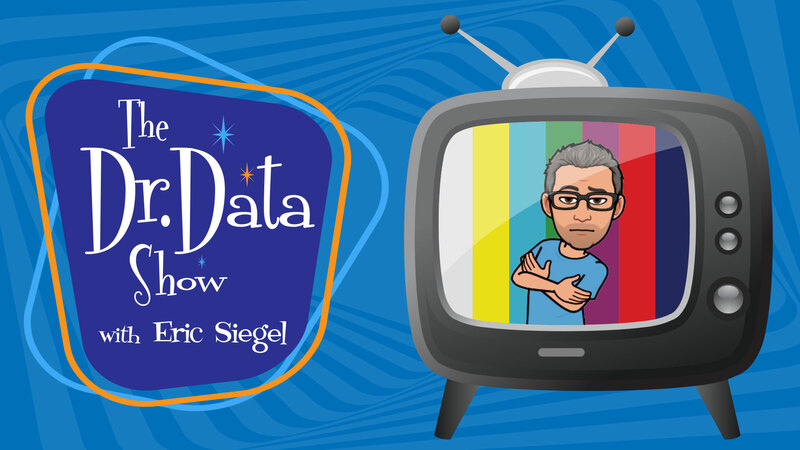 Note: This article is based on the transcript of a special episode of The Dr. Data Show – click here to view. 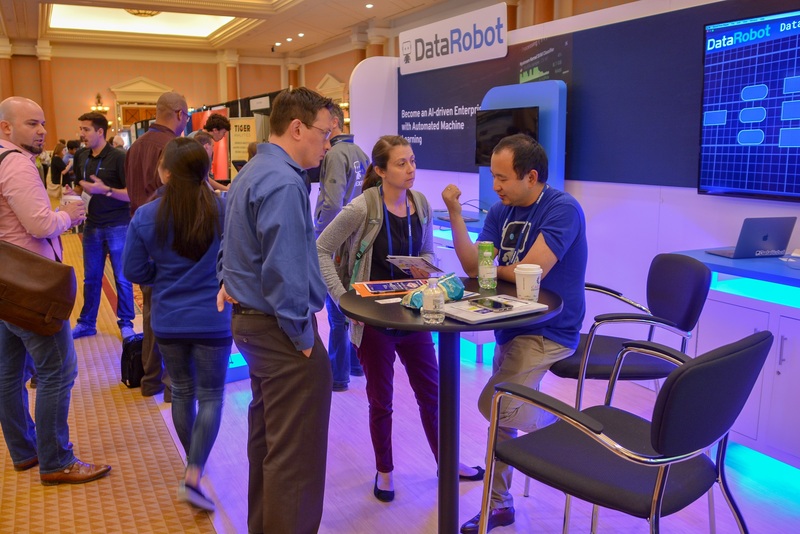 In this article, I gives five reasons that Mega-PAW Vegas – June 16-20, 2019 at Caesars Palace, Las Vegas – is the most valuable machine learning event to attend this year. 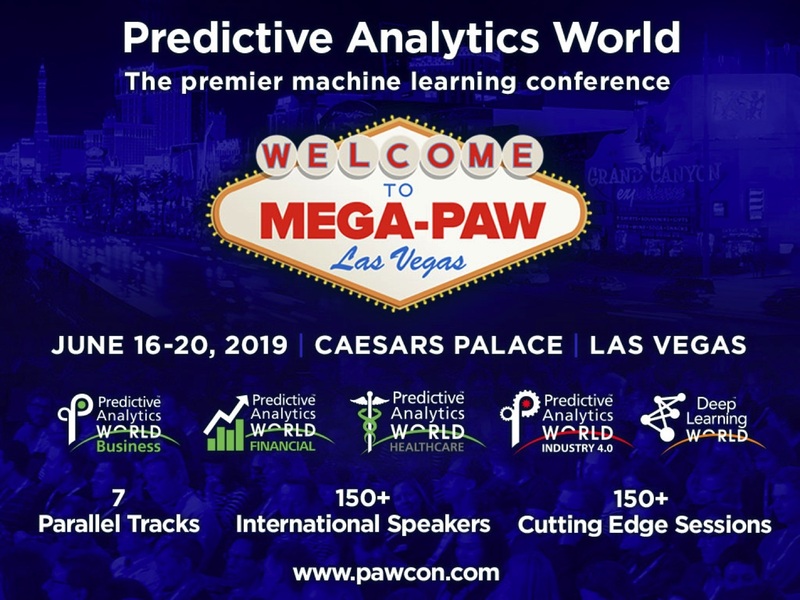 Mega-PAW is the largest annual five-conference blow-out of the Predictive Analytics World conference series, of which I am the founder. First, some background info. Your business needs machine learning to thrive and even just survive. You need it to compete, grow, improve, and optimize. Your team needs it, your boss demands it, and your career loves machine learning. 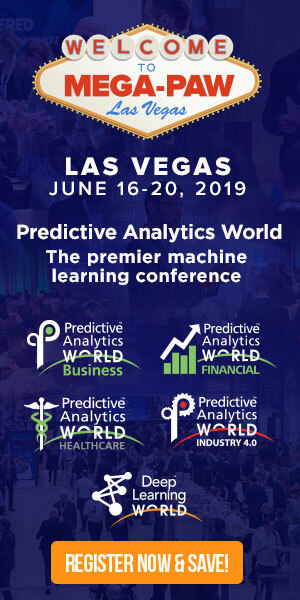 And so we bring you Predictive Analytics World, the leading cross-vendor conference series covering the commercial deployment of machine learning. By design, PAW is where to meet the who’s who and keep up on the latest techniques. 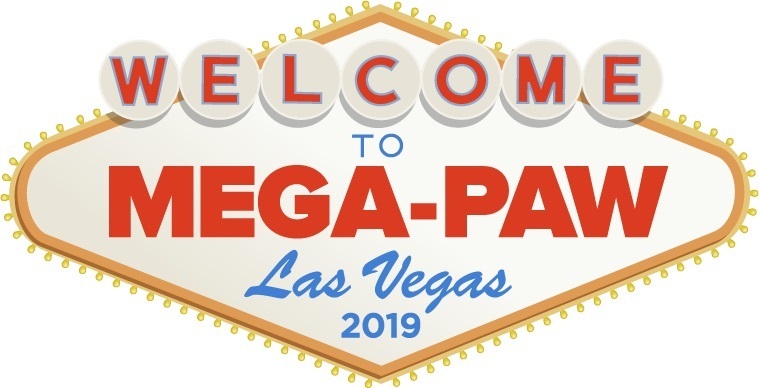 This June in Vegas, Mega-PAW brings together five different industry-focused events: PAW Business, PAW Financial, PAW Industry 4.0, PAW Healthcare, and Deep Learning World. This is five simultaneous two-day conferences all happening alongside one another at Caesars Palace in Vegas. Plus, a diverse range of full-day training workshops, which take place in the days just before and after. This mega event covers all the bases for both senior-level expert practitioners as well as newcomers, project leaders, and executives. Depending on the topic, sessions and workshops are either demarcated as the “Expert/practitioner” level, or for “All audiences”. So, you can bring your team, your supervisor, and even the line-of-business managers you work with on model deployment. About 60-70% of attendees are on the hands-on practitioner side, but, as you know, successful machine learning deployment requires deep collaboration between both sides of the equation. PAW and Deep Learning World also takes place in the U.K. and Germany, and PAW Government takes place in Washington DC — but this article is about Mega-PAW Vegas, so see predictiveanalyticsworld.com for details about the others. Here are the five reasons to go. Number one, you’ll access brand-name case studies. At PAW, you’ll hear directly from the horse’s mouth precisely how Fortune 500 analytics competitors and other companies of interest deploy machine learning and the kind of business results they achieve. More than most events, we pack the agenda as densely as possible with named case studies. Each day features a ton of leading in-house expert practitioners who get things done in the trenches at these enterprises and come to PAW to spill on the inside scoop. 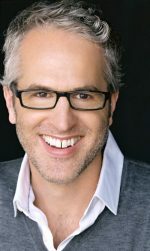 In addition, a smaller portion of the program features “rock star” consultants, who often present on work they’ve done for one of their notable clients. Number two, you’ll benefit from cross-industry coverage. As I mentioned, Mega-PAW features these five industry-focused events. This amounts to a total of seven parallel tracks of sessions. Bringing these all together at once fosters unique cross-industry sharing, and achieves a certain critical mass in expertise about methods that apply across industries. If your work spans industries, Mega-PAW is one-stop shopping. Not to mention that convening the key industry figures across sectors greatly expands the networking potential. The first of these, PAW Business, itself covers a great expanse of business application areas across many industries. Marketing and sales applications, of course. And many other applications in retail, telecommunications, e-commerce, non-profits, etc., etc. 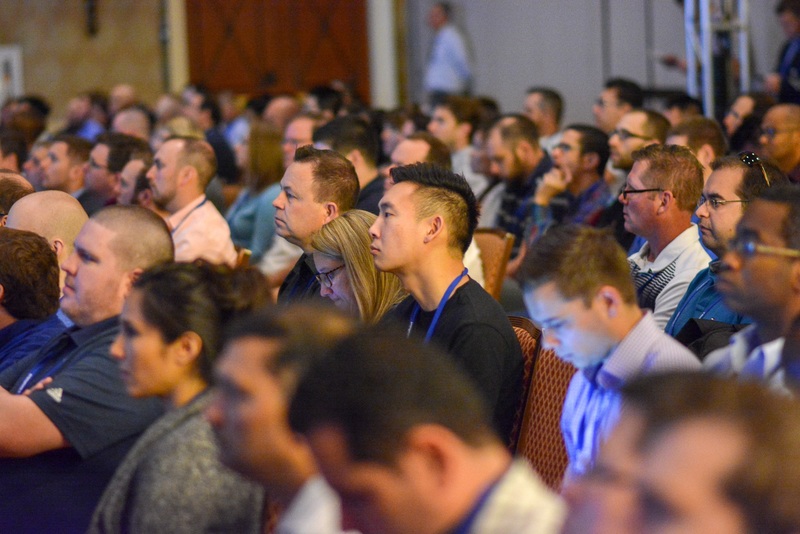 PAW Business is a three-track event with track topics that include: analytics operationalization & management — i.e., the business side — core machine learning methods and advanced algorithms — i.e., the technical side — innovative business applications covered as case studies, and a lot more. PAW Financial covers machine learning applications in banking — including credit scoring — insurance applications, fraud detection, algorithmic trading, innovative approaches to risk management, and more. PAW Industry 4.0 and PAW Healthcare are also entire universes unto themselves. You can check out the details about all four of these PAWs at predictiveanalyticsworld.com. And the newer sister event Deep Learning World has its own website, deeplearningworld.com. Deep learning is the hottest advanced form of machine learning with astonishing, proven value for large-signal input problems, such as image classification for self-driving cars, medical image processing, and speech recognition. These are fairly distinct domains, so Deep Learning World does well to complement the four Predictive Analytics World events. Number three, you’ll get pure-play machine learning content. PAW’s agenda is not watered down with much coverage of other kinds of “big data” work. Instead, it’s ruthlessly focused specifically on the commercial application of machine learning — also known as predictive analytics. The conference doesn’t cover “data science” as a whole, which is a much broader and less well-defined area, that, for example, can include standard business intelligence reporting and such. And we don’t cover “AI” per se. Artificial intelligence is at best a synonym for machine learning that tends to over-hype, or at worst an outright lie that promises mythological capabilities. Number four, you’ll learn the latest and greatest, the hottest new machine learning practices. Now, we launched PAW over a decade ago, so far delivering value to over 14,000 attendees across more than 60 events. To this day, PAW remains the leading commercial event because we keep up with the most valuable trends. For example, Deep Learning World, which launched more recently — in 2018 — covers deep learning’s commercial deployment across industry sectors. This relatively new form of neural networks has blossomed, both in buzz and in actual value. As I mentioned, it scales machine learning to process, for example, complex image data. And what had been PAW Manufacturing for some years has now changed its name to PAW Industry 4.0. As such, the event now covers a broader area of inter-related work applying machine learning for smart manufacturing, the Internet of Things (IoT), predictive maintenance, logistics, fault prediction, and more. In general, machine learning continues to widen its adoption and apply in new, innovative ways across sectors — in marketing, financial risk, fraud detection, workforce optimization, and healthcare. PAW keeps up with these trends and covers today’s best practices and the latest advanced modeling methods. And finally, number five, you’ll access vendor-neutral content. PAW isn’t run by an analytics vendor and the speakers aren’t trying to sell you on anything but good ideas. PAW speakers understand that vendor-neutral means those in attendance must be able to implement the practices covered and benefit from the insights delivered without buying any particular analytics product. During the event, some vendors are permitted to deliver short presentations during a limited minority of demarcated sponsored sessions. These sessions often are also substantive and of great interest. In fact, you can access all the sponsors and tap into their expertise at will in the exhibit hall, where they’re set up for just that purpose. By the way, if you’re an analytics vendor yourself, check out PAW’s various sponsorship opportunities. Our events bring together a great crowd of practitioners and decision makers. And those are the reasons to come to Mega-PAW: brand-name, cross-industry, vendor-neutral case studies purely on machine learning’s commercial deployment, and the hottest topics and techniques. Mega-PAW Vegas not only delivers unique knowledge-gaining opportunities, it’s also a universal meeting place — the industry’s premier networking event. It brings together the who’s who of machine learning and predictive analytics, the greatest diversity of expert speakers, perspectives, experience, viewpoints, and case studies. This all turns the normal conference stuff into a much richer experience, including the keynotes, expert panels, and workshop days, as well as opportunities to network and talk shop during the lunches, coffee breaks, and reception. I encourage you to check out the detailed agenda — see all the speakers, case studies, and advanced methods covered. Each of the five conferences has its own agenda webpage, or you can also view the entire five-conference, seven-track mega-agenda at once. This view pertains if you’re considering a “Mega Pass” registration, or if you’ll be attending along with other team members in order to divide and conquer. Visit our website to see all these details, register, and sign up for informative event updates by email. Or to learn more about the field in general, check out our Predictive Analytics Guide, our publication The Predictive Analytics Times, which includes revealing PAW speaker interviews, and, episodes of this show, The Dr. Data Show — which, by the way, is generally about the field of machine learning in general, rather than about our PAW events.